You’ve grown a beard, so what’s next? How you care for your beard— “beard grooming”—is a key factor in whether it adds to or detracts from your appearance. We’ve got the lowdown on beard maintenance, plus tips on how to get great results from beard products. The first step in maintaining your beard is to cleanse it regularly. But don’t bother with a special beard shampoo! That’s because most beard shampoos are nearly identical to the shampoo you use to wash your hair! That means each time you lather up the hair on your head, simply lather up your beard, too! To avoid irritating the skin beneath your beard, use a minimally fragranced or fragrance-free product, such as our PC4MEN Body Wash, and be sure to rinse thoroughly. 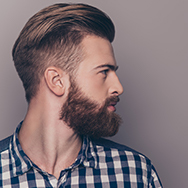 Unlike the hair on your head, beard hair tends to have a coarser, often thicker texture, which requires more upkeep than just a quick shampoo and rinse. Even if you don’t use conditioner in your hair, your beard will benefit from routine application of a moisturizing conditioner—either one you rinse out in the shower or a leave-in formula (the latter tend to be lighter-weight). You can use a regular hair conditioner (drugstore brands are fine) or check out the beard conditioners offered by various men’s grooming brands. Before you buy, be aware that finding the conditioner that’s right for you can take some experimentation; you might need to try a few before you hit the sweet spot. Tip: It’s OK to apply a small amount of a regular conditioner to your beard for extra smoothing, softness, and even a bit of shine—no need to rinse. We wish beard maintenance were as carefree as just relaxing in the pool, but if you want to keep it looking good, you need to trim it regularly. How often you need to trim your beard depends on its shape, how fast your whiskers grow, and how dense your beard is. Of course, a full beard or faded beard requires more upkeep than, say, a goatee. Beard comb or brush—Always brush out your beard before trimming for the most accurate results. Ask your barber for recommendations. Battery-powered, rechargeable clippers to shape and thin your beard as needed, as well as to remove whisker “stragglers” that grow just outside the lines of your beard’s shape. Philips, Panasonic, and Wahl make good ones that get high ratings from the facially hirsute. Beard conditioner or a beard oil to groom your trimmed beard, enhance its softness (anyone you routinely kiss will thank you for this), and make it look healthier. Avoid highly fragrant beard oils; the fragrance won’t harm the beard itself, but if it reaches the skin beneath, it can trigger redness, bumps, and itchiness. A few drops of Paula’s Choice Skincare Moisture Renewal Oil Booster will do the job without adding any fragrance. Always trim your beard when it’s dry—wet trimming, even if your clippers can be used with water—doesn’t allow for as much precision or control. Tip: When you first use beard oil or conditioner, apply sparingly. You can always add more if needed, but overdoing it can make your beard look greasy or matted. While enjoying and maintaining your beard, some guys might experience a few issues that affect how the skin beneath it looks and feels. Pores can become clogged, red bumps (or even acne) can develop beneath the beard, and ingrown hairs can occur. The solution to these concerns is refreshingly simple: Daily use of a well-formulated beta hydroxy acid (BHA) exfoliant. A liquid exfoliant you can splash onto the bearded area and rub into skin beneath plus apply to the rest of your face is ideal. It’s easy to use, and feels weightless. The BHA ingredient—known as salicylic acid—calms redness, exfoliates to diminish bumps, and also helps alleviate ingrown hairs. PC4MEN Soothe & Smooth is a great (and gentle) option; if you’re dealing with acne beneath your beard, look to one of our CLEAR Anti-Redness Exfoliating Solutions. Learn more about skin care for men.